Najee is a master storyteller. Whether the debonair multi-instrumentalist is engaged in a verbal or musical conversation, his alluring charisma has a way of seducing you into his world. A quadruple threat who is equally adept on soprano, tenor and alto saxophones and flute, Najee’s technical agility, grace, compositional prowess, unbridled passion, fearless genre bending and superior musicianship have made him one of the most sought after musicians of his generation. In a business where trends and artists come and go, Najee’s name is synonymous with innovation, consistency and the best in contemporary jazz. With two Platinum and four Gold albums under his belt, he is an icon whose musical vision spawned an entire new genre by fusing the music close to his heart (R&B and jazz). Three decades later he is showing that he is not done yet! 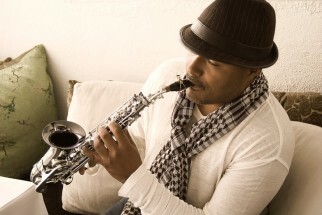 An alum of the New England Conservatory of Music, Najee was mentored by jazz giants Frank Foster and Jimmy Heath as well as classical maven and flutist Harold Jones of the New York Philharmonic. He has collaborated with everyone from Prince and Quincy Jones to Stevie Wonder, Chaka Khan and Herbie Hancock. He has also had the distinction to perform for Presidents Bill Clinton and Nelson Mandela and made appearances on The Tonight Show and Good Morning America. On January 31, 2012, Shanachie Entertainment released Najee’s highly anticipated label debut, The Smooth Side Of Soul, a sublime offering from the peerless instrumentalist and composer, that is a testament as to why he has long reigned as the King of contemporary jazz.